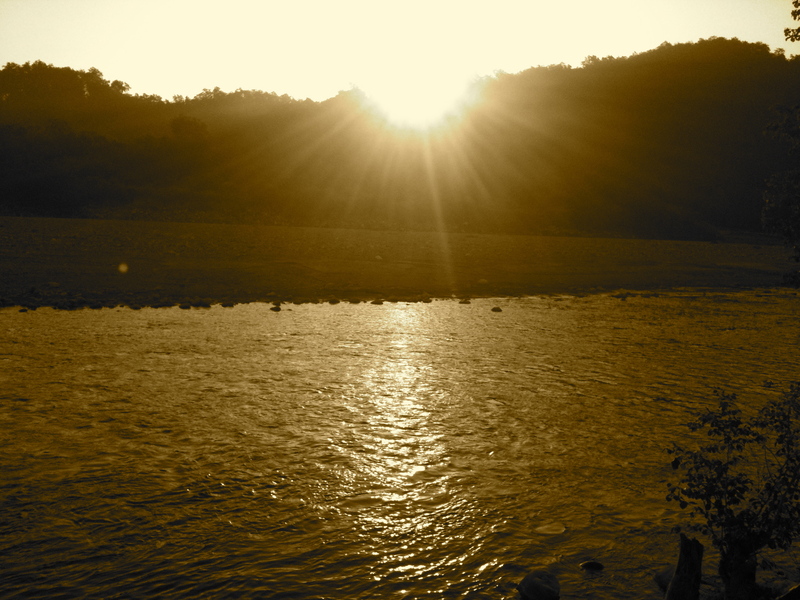 Sitting across the Kosi River, I watch the sunlight dancing in the river, the water splashing over the rocks. Surrounding me is the Jim Corbett National Park, part in Uttarakhand and part in Uttar Pradesh. This Corbett adventure is part of Club Mahindra‘s travel blogging trips across India, and I feel privileged to be part of it this year. Three days ago, six of us bloggers arrived at the Club Mahindra Safari Resort, with dreams of looking a tiger eye-to-eye in India’s oldest tiger reserve. As we watched the sun rise over Kosi from behind the mountains that morning, we didn’t know that we’d leave seeing a lot more. We’ve spent a chunk of the day in the jungles of Corbett, praying for a glimpse of the elusive big cat, thanking our stars for a rare sighting of the Yellow-throated Marten, and marveling at the magnificent colors of the Kingfisher, the Woodpecker & the Chestnut Bee-eater. I’ve rediscovered my love for the wilderness, but I’m equally glad to be back in my apartment; it is not everyday that I’m pampered with riverside luxury. In the jungles of Corbett. A yellow-throated marten crossing the road. The closest we got to a tiger at Jim Corbett. I lounge in my balcony a little longer, charmed by the tirelessly flowing river, then reluctantly give up my spot for a discussion on India’s biodiversity with Mr S.Karthikeyan, the first Indian naturalist I’ve met. I’m transfixed as he displays figure after figure, and picture after picture, of the lives we never think about. That night, he catches a little beetle crawling along a wall light, gently but firmly overturns it, and asks us what a cockroach does when overturned. Struggles, I think to myself, ducking my head close to it. Much to my surprise, the little guy leaps in a high back-flip and turns itself upright – a flipping beetle, it’s aptly called! Smiling, I think he too could be a tiger in an alternate universe. View from my Club Mahindra apartment. As the sun starts to fade away in the evening sky, I stroll along the river, past the swimming pool, and into the gardens where the grass is still glittering in the fading sunlight. They remind me of the gardens we saw surrounding Jim Corbett‘s winter home; the National Park is named after this British hunter who saved many a villagers by hunting man-eating tigers & leopards, 50 and 250 of them respectively, to be precise! I imagine Corbett’s lifestyle back in the 40s, when his humble two bedroom house must’ve been surrounded by dense forests with only a trail leading up to it. I imagine the nights he must’ve sat out, looking for his victims. A shiver runs down my spine as I see a cat staring at me from the path ahead, and I calmly make my way back to where my blogger friends are furiously photographing the orange sky and its reflection on the water. Luxury in nature’s lap. That could be Club Mahindra’s new tagline! As the air starts to get chilly, we camp ourselves under the stars and watch the artists of the region perform a Kumaoni version of the bagpiper. Every now and then, we look up from our delicious traditional Kumaoni meal and catch a shooting star, until the moon reveals itself from behind the mountains, and hogs all our attention. Following a string of after-dinner conversations & desserts, I walk back to the coziness of my room, convinced that ours is a lucky generation to enjoy the comforts of modern-living amid the charms of nature. Join me on Facebook & Twitter to share & exchange more travel stories. There are some really beautiful places inside the jungle (FRHs) as well. I understand that for this one, you would stay at ClubM place. Thank you for the update. It has been years since I visited the Jim Corbett national park (1983). The pool is new and it was a bit more rustic. Never saw a tiger but we heard them and it was a blast riding the elephants it the bush. I love India. That’s a very different picture f corbett u have painted……the one f luxury. My trip there was different experience….yet 1 to remember. One f the few times that i enjoyed a trip to a wild life resort. Nd ya was able to spot a tiger there……were u lucky enough to see 1??? You spotted a tiger there? Lucky bum. We tried so hard, but the closest we got were some elusive pug marks. Aww I’ve been there, lovely Corbett, we didn’t even manage to get that close to a tiger, although we did try really hard! Same here Angela, but all the anticipation was a lot of fun too. Hopefully next time! I think spotting tiger in Corbett Park depends on a good luck. I visited the park for two times. But seeing tiger eye to eye in Corbett is not in my destiny. May be next time few years later. Best wishes Shivya. Keep the great work. I visited Corbett in 1995. Was surreal….around the turn of the year , was freezing cold, had to carry our wood into our cabin/ room ourselves in the freezing weather, in the middle of the night at times….was great….These pix are beautiful but very modern, i wish club Mahindra’s architecture was more rustic, more Corbett, this pic could be from anywhere Bali, Samui, Langkavi, I wish it was more “Corbett, India and no where else in the world” ….if you know what I mean. Sounds cold & lovely, Sonal. Did you stay in the forest? 1995 must’ve been a great time to visit, without as many jeeps & people as my trip. Nice! Looks like you guys had a blast of a time. i still have some happy memories from my last club mahindra bloggers trip. Tough luck on the tiger part, but looks like you guys got to see the other side of the forest properly. We did 🙂 Would’ve been fun to meet you too. Loved the forest anyway! Why are we so hung up on what we didnt see? Yes, the tiger is on top of the food chain and looks magnificent – but in the quest for the tiger we miss out so many other amazing creatures in the wild – I am not so fond of tiger reserves for that one reason. You go with a group – they are all keen to see only the tiger – on the way we miss out on so many other things, which are equally amazing and more importantly visible! One reason the tiger numbers are dwindling is also because of this collective obsession! I am sure Karthik mentioned that many times! And not so hung up on the tiger. We went home seeing a lot more, not just in the forest but all around us! The wilderness charms you in a way that’s hard to explain. Simply beautifully captured shots…lovely reading! I need to go soon now! Seems you guys had great time. It has been quite a number of times that my wife has asked me to cover this part too but everytime something or other happens. Now, reading your post I do believe that I am missing something. Looks like some weekend around a corner is waiting to be choosen between Ranthmbore and Jim Corbett …. Only too lucky ones see Tiger in Jim Corbett as only few of my friends have told they saw it after being there n number of times. We did! It was my second time there and both experiences were so different from each other. I think Corbett is one of those places you can never get tired of visiting, and the forests never seem less welcoming 🙂 Hope you go soon and spot the big cat! Beautiful blog on Corbett. I’ve been planning for a while. What’s the right time of the year to be at Corbett? And any tips? Thanks Vipin 🙂 The forest is shut during monsoons and then a little longer for the roads to be relaid. November to April is nice & pleasant. If you’re looking for a relaxing, luxurious getaway, Club Mahindra’s resort is lovely with its riverside location. A budget option could be a homestay in one of the villages around Corbett or the forest guest house (which needs to be booked way in advance). You need to really lucky to be able to spot a tiger, but the other wildlife & birds in the forest will enchant you no less 🙂 Have fun! We did, Valerine 🙂 Haha, haven’t thought that far yet. Still got lots of places on my bucket list! For me my last visit to corbett in march I spotted 4 tigers together it was kind of a family. We had stated at this beautiful resort Aahana Corbett wilderness. The most serene places I have been to. Previous Post200th Post Special: Travel books Giveaway! Next PostMalaysia: 3 Travel Adventures You Don’t Want to Miss.